For many British gamers of ‘a certain age’, when asked which boxing game they remember most, the answer would undoubtedly be Frank Bruno’s Boxing. Released by Elite (the EA Games of the ’80s, churning out more tie-in games than anything else) back in 1985, it was a pretty lacklustre port of Nintendo’s arcade cab Super Punch-Out!! and is perhaps known more for its in-your-face racial stereotypes than the gameplay itself. The Italian contender went by the name of Ravioli Mafiosi, the Canadian Crusher (who looked like Bluto from Popeye, or Chris Moyles) came on to Monty Python’s Lumberjack song, and the Japanese offering was known as Fling Long Chop, from the land of the rising Hi-Fi and a master of No-Can-Do. As crude as the whole thing was, however, it was damned good and provided many happy hours for young punch-happy gamers. Compared to football, hockey and even winter sports, boxing has never quite taken a strong foothold on the gaming ladder and that’s perhaps down to the fact that we haven’t really had that many solid contenders over the years. The Fight Night franchise took a more mainstream stance and Punch-Out!! went for the more arcade-style approach while Rocky Balboa took it a little too far and opted for a much more cinematic styling that required far too many button combos to pull off, and ultimately put most off. Boxing should be about instinct and reaction rather than an encyclopaedic knowledge of every possible way to attack and defend, so the games should reflect this. Thankfully, Vivid Games’ Real Boxing manages to do this pretty successfully. All of the bells and whistles of the huge arena are out of the window; there are no sixty-second intros where each boxer struts toward the ring, soaking up the adulation from the crowd as they play to a ridiculous persona with a pounding back-beat. There’s no over-the-top vitriol where they play up to the camera beforehand and no sign of bling as far as the eye can see. Instead, you’re left with a solid game that follows your career as you duck, dodge, dive, dip and dodge your way through countless opponents to the top of your game. As tends to be the case these days, your first port of call is the character customisation suite where you set your fighter’s ethnicity, facial hair, hair style, short colours and even tattoos. Sadly, it wasn’t possible to recreate Mr T, and most of my attempts ended up looking like a washed up ex-boy-band frontman – stubble, tattoos, troubled brow, and the sort of hairstyle that celebs pay hundreds for whereas your man on the street achieves the same look by not brushing his hair. In a surprise twist, you’re immediately taken to the skill tree and encouraged to spend a few points on the actual meat and bones of the game – how your fighter performs. The attributes on offer are speed, strength, and stamina, and balancing these as you continue through your career becomes more difficult as the opponents become more varied. As this was something I wasn’t expecting to see until after the first few bouts, however, it was more than welcome and helped to give the impression that you genuinely were responsible for your own career from the outset, rather than playing with a re-skinned default character until enough points were earned to begin the customisation. 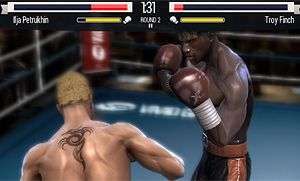 It’s the gameplay itself which sets Real Boxing apart from other titles in the genre, however, as it requires a keen eye, a degree of focus, and lightning-fast reactions. As someone who has managed to fluff their way through Street Fighter and Tekken by adopting the age-old ‘button mashing’ technique, I instinctively opted for the same play-style with Real Boxing and was very quickly beaten to a pulp. The second, third and tenth attempts resulted in this same fate, and so I eventually conceded; this was a game where I had to pay attention. The reason for this is that your stamina will deplete if you go in guns blazing, throwing fists around like Ike Turner, which means that any subsequent blows delivered will have as much impact as a flatulent fairy. Much like with drumming, Real Boxing becomes all about finding space within the chaos and using it to your advantage, so timing dodges and coming back out with a solid uppercut or stealthy jab serves you best. If you’re successful in dodging an attack, and counter with a direct hit, your opponent’s health be affected more than it would with a regular hit and, in turn, your own stamina bar will see a considerable gain. The Vita’s accelerometer also comes in to play when either fighter loses enough stamina and opts to ‘hug it out’ in an attempt to recover. On-screen you’ll be presented with a balance meter where your goal is to prevent a needle from going into the red before the timer runs out, as this will aid in recovering a decent portion of your stamina bar. Fail, and your own stamina will go down a little more, but your opponent’s stamina will pick up a boost. From this point on, every single block and attack will count for more because the scales are well and truly tipped in favour of the other guy. A series of mini games cover the training aspect of the game, where you head back to the gym after each fight in an attempt to earn enough points to unlock perks such as being able to recover from a potential knock-out quicker than before. As the game progresses, these perks, along with the regular skill boosts on stamina, speed and strength, will make all the difference because, as you’d expect, your opponents in the later end of the game are evil compared to those in the beginning. Another mini game, insofar as it’s essential to gameplay but not available to play directly, comes in the form of knock-out recovery. A rhythmic tap of the left and right shoulder buttons before the timer counts down will determine whether you’re able to recover or end up eating canvas. As the opponent difficulty increases, so too do the recoveries, and where you may have noticed a quick two-centimetre jump of the bar in earlier matches, hammering away at the shoulder buttons later on will, if you’re lucky, move mere millimetres. Veterans of Track And Field will have no trouble. You may need to buy a new Vita, however. 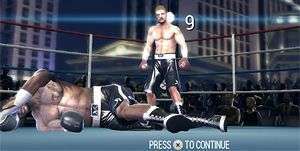 In order to capitalise on the Vita’s touch controls, Real Boxing offers a more tactile approach to gameplay for those who’d rather steer clear of the d-pad and analogue sticks, with on-screen prompts for jabs, dodges and other moves. It’s not actually that bad, truth be told, but it felt like the game was immediately compensating for this by making everything so much easier than before which, in my opinion, detracts from the point of ‘Real’ Boxing. Overall, this is one of those games that you can dip in and out of, spending a few minutes here while your Xbox or PS3 forces the latest update, and can just as easily provide hours of seriously-challenging gameplay. It’s not hyper realistic, but neither is it stylised and childish; it’s a faithful boxing simulator with enough features to keep you reaching for the Vita and certainly has that ‘one more play’ aspect. Real Boxing is a treat for those boxing fans who have longed for a decent simulator and don't want the glitz and glamour that other franchises have brought with them. It's addictive, very intuitive in terms of reflexes and instinct, and awards players who opt to pay attention to genuine gameplay, penalising those who go down the hit-and-hope button mashing route. In short, it's one of those gems that the Vita was designed for - gaming on the go, without the need to sit down for hours and hammer away. Know wot I mean, 'Arry? I think I may have to buy this. Good review. I read it during toilet breaks and ended up with pins and needles.